Once more in November, 2012 I'm heading south to Florida. This time I'm also planning to stop in the Albemarle Sound to spend time with my brother and sister-in-law at their new home in the Albemarle Plantation development. The development includes a marina at which I will berth Sarah until after the Thanksgiving holiday, during which we will be joined by the rest of the Stevenson family. 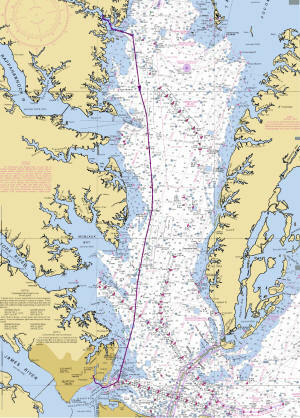 The initial leg of the trip was down the Chesapeake Bay to Hampton, VA. 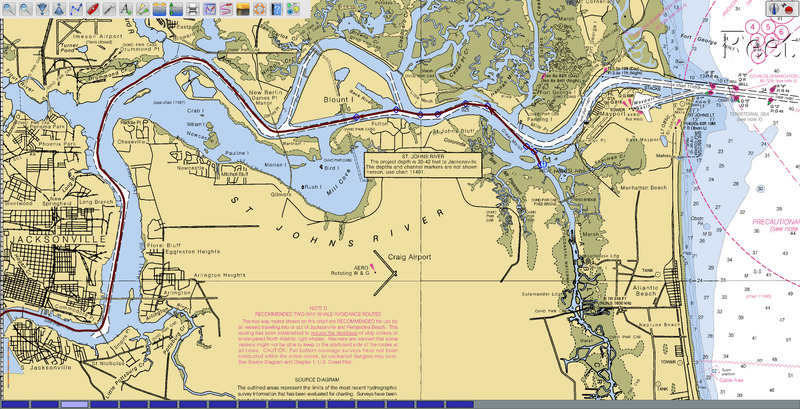 The trip from the Great Wicomico River to Hampton is shown on the right. I spent three nights at the Hampton Pulbic Docks (1 night free out of three), then headed down the Elizabeth River to Deep Creek and to the Dismal Swamp Canal and the Pasquotank River to Elizabeth City, NC. Entering Yeopim River and Albemarle Plantation Marina After two nights at the free docks in Elizabeth City I headed to my brother's home in the Albemarle Plantation. 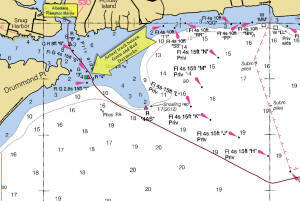 The marina for this development is located in Yeopim Creek about 15 nm west of Elizabeth City. Getting there requires clearing the restricted area off Harvey Pt. then entering Yeopim River As shown in the picture on the left there is not a lot of help from the charts. 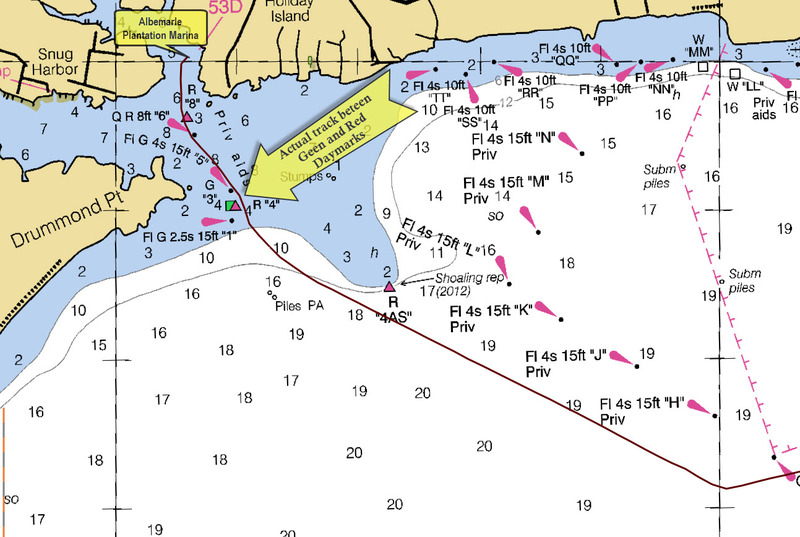 There are very few soundings on the chart of the entrance to the river and the charted position of some of the marks do not agree with the GPS location. 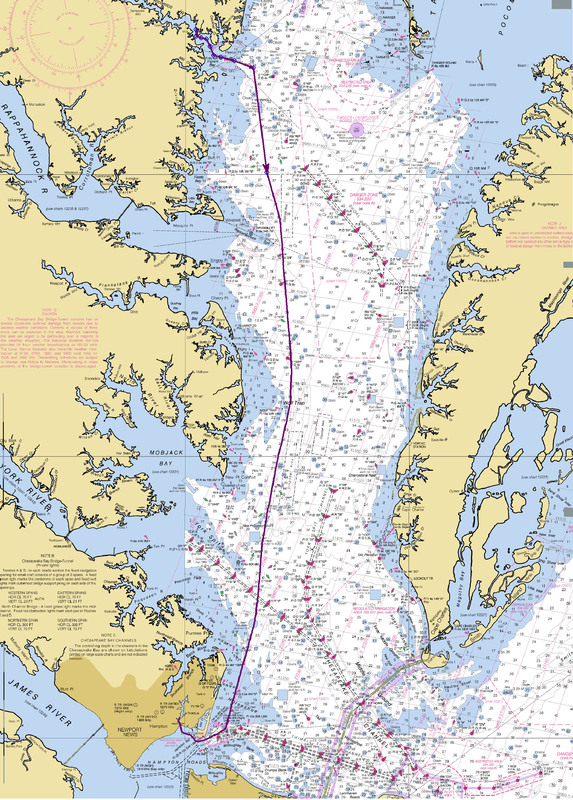 However if you follow the channel marks there is not problem getting to the Albemarle Plantation Marina with over 7' of depth. If you stay at the marina and draw 5' or more make sure they put you at the end of "A" dock. I was initially put on "C" dock and had to plow a path out of the slip. After the Thanksgiving holiday I resumed the trip south stopping at the Alligator River Marina and the River Forest Marina in Belhaven, NC. Then I anchored in Cedar Creek just off the Adams Creek ICW below Oriental, NC. I waited for 3 nights in Cedar Creek for moderate conditions off-shore. 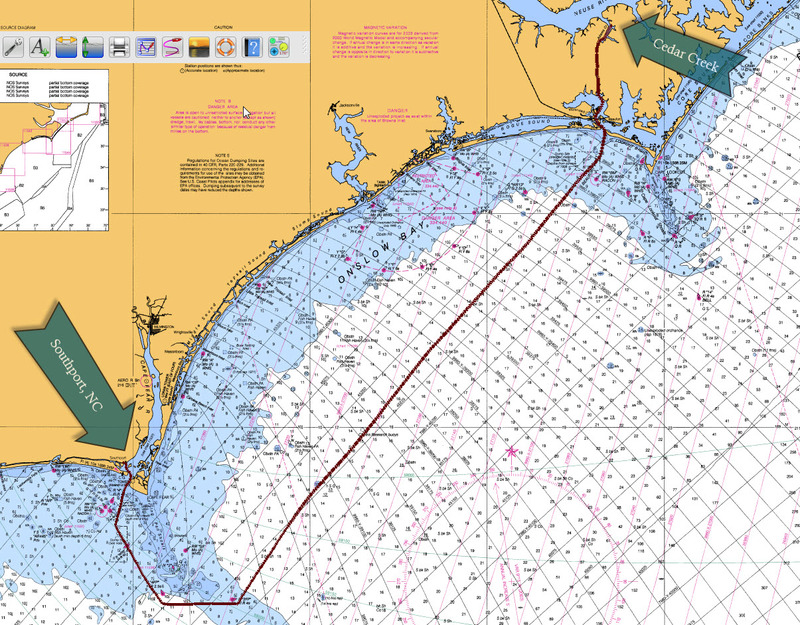 Then I headed out the Beaufort Inlet and turned SW to Cape Fear. It was a cold and rough passage down the coast. As I crossed the Frying Pan Shoals off Cape Fear I noticed that my anchor had come loose and was swinging free off the bow. I tried to get it back on the deck, but the motion at the bow was too rough. 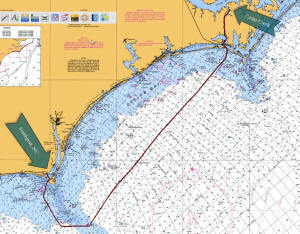 I had to wait until I cleared the shoals and headed for the Cape Fear River before I could secure the anchor on deck. During that time it did a lot of cosmetic damage to the Sarah's bow. I was very exhausted by the time I put into the Southport Marina. I ended up staying nearly a week resting up and waiting for a decent weather window to continue south. When I finally left the trip was fairly comfortable, but very cold. I stopped in the Charleston Maritime Center for four nights. During this period there were mostly headwinds for the remainder of the trip to Florida. 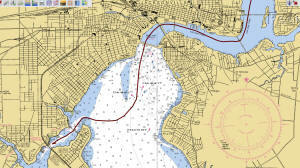 Eventually I had to move to the Charleston City Marina as the Maritime Center could no longer provide me with a berth. Once again I had to wait in Charleston about a week until conditions were acceptable for another outside push south. On Thursday, 12/20/2012 a strong cold front swept through S. Carolina bringing gale force winds. 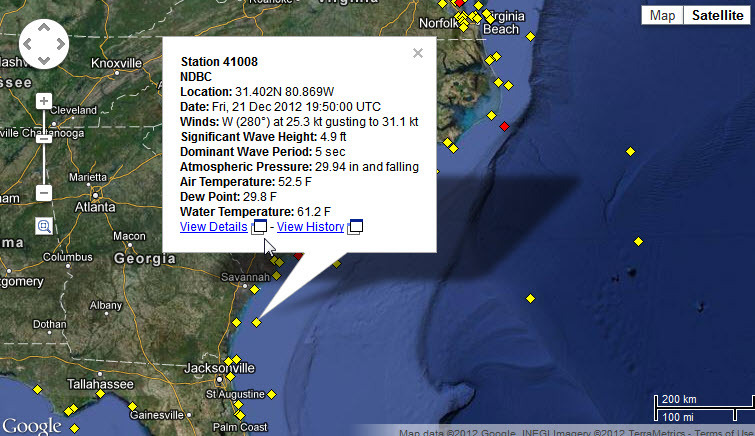 By Friday the winds had not diminished at all as shown by the NOAA buoy above. I had hoped to leave on Saturday, but winds were not expected to abate until late on Saturday. Conditions did improve on Sunday, and I had a decent weather window to head down the coast to Florida. The NOAA forecast called for a 10-15 kt headwind most of the way, but the winds lightening as I got south of Savannah, GA. This meant no sailing with the winds on the nose and slow going under power most of the way. 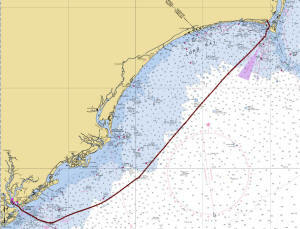 My major concern was arriving at Fernandina Beach by early afternoon on Monday, 12/24/2012. That is Christmas Eve and I knew the marina would be closing early. 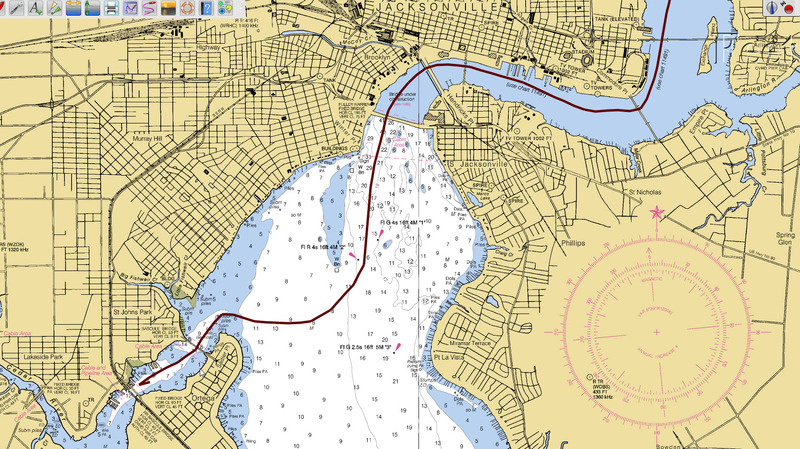 I left the Charleston City Docks at 08:30 AM and rode the ebb tide out of the harbor. When I initially turned south the winds were very light out of the west and only a slight chop from that direction. By that afternoon the winds had built to the forecast 15 kts and I was motoring into a 2' chop. This slowed Sarah down to less than 5 kts. That speed would significantly delay my arrival time. I increased the engine RPMs from 2100 to a little over 2400 and the speed was back to 6 kts. Around midnight the winds began to drop and my speed increased to 6.5 kts. 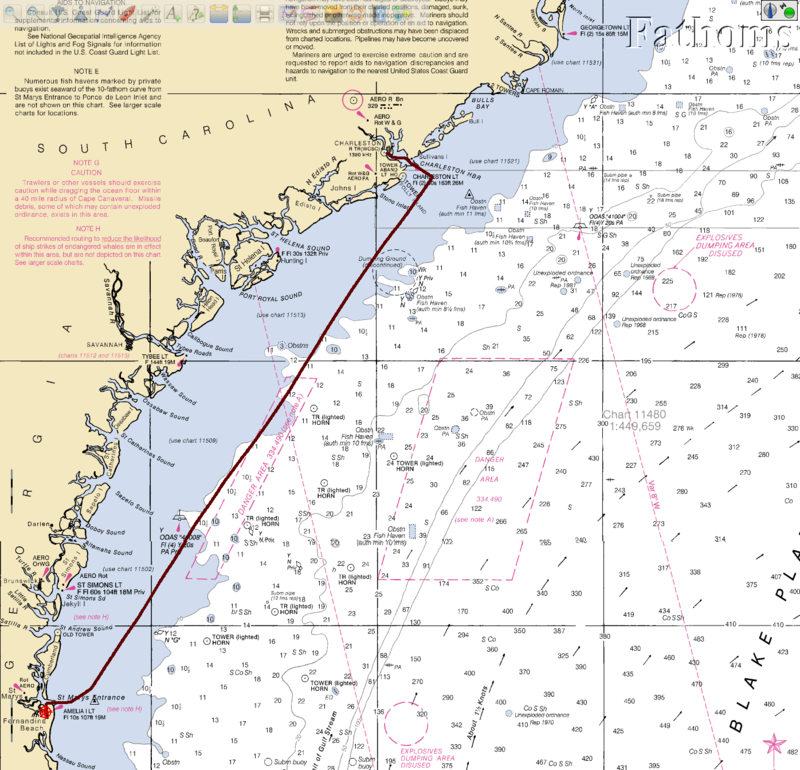 This provided ample speed and I arrived off the Fernandina Harbor Marina around 11:00 AM. I re-fueled and put Sarah into a berth at the marina, then crashed for about 4 hours. 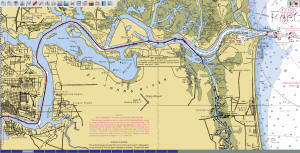 I had planned to depart Fernandina the day after Christmas and motor down the AICW to the St. John River then continue north to the Ortega River. However, the weather forecast called for another strong cold front to approach the area on Christmas night and bringing heavy winds, rain and thunderstorms to the area on the following day. 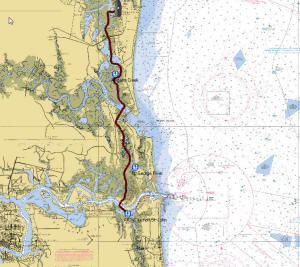 Also the tides on the St. John at this time are not favorable for a run up the river in the afternoon. 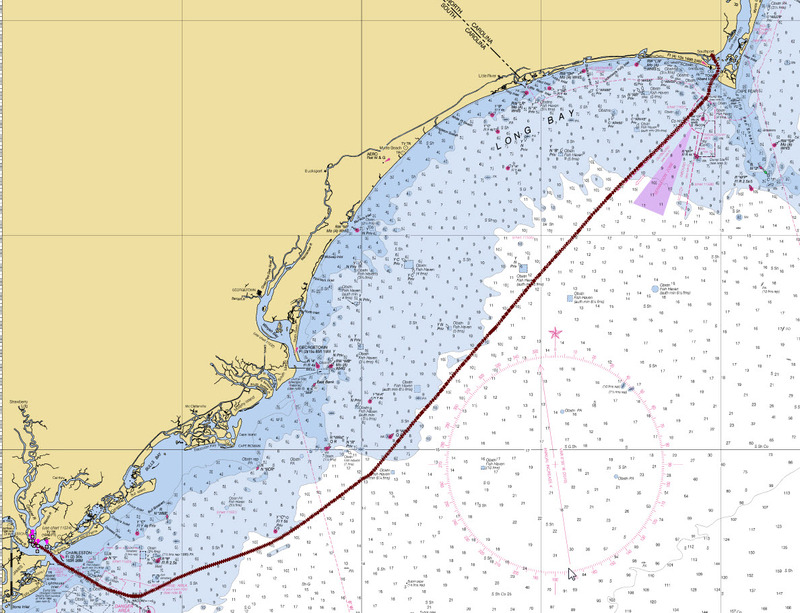 I kept waiting at Fernandina Beach for a decent 2-day weather window to allow me to move to the St. John River and anchor for the night and then head up the St. John to the Ortega River the next morning. In 2011 I was able to make the trip Fernandina to Jacksonville in a single day, but then there was a flood current on the St. John in the afternoon. This year the afternoon current was an ebb and a spring tide ebb with a maximum current of over 3 kts. There was no way I could motor through that current and clear the Main Stree Bridge in Jacksonville before it closed for the evening rush hour. 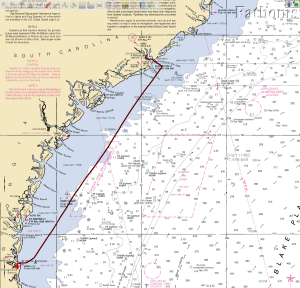 Finally on December 31 I had a good weather window and departed Fernandina Beach around 8:30 AM. I motored down the AICW and arrived at the St. John about noon. The ebb had not quite started and I was tempted to turn up the river to Jacksonville. I overcame that temptation and anchored for the night just off the AICW on the other side of the St. John. Up the St. John River to Jacksonville, FL The next morning I had the anchor up before 9:00 AM motored on the flood current to the Ortega River. The entrance to the Ortega River is a little tricky as the only channel marks do not appear on even the latest NOAA RNCs. This was my third time entering the Ortega and I think I've finally figured it out. Sarah and I will remain in Jacksonville for most of 2013 while I complete a number of upgrades and repairs to this old boat.